Click here to download the souvenir programme. This was an original pantomime based on the stories of the Brothers Grimm. The plot features characters from Rapunzel, Rumpelstiltskin, Hansel and Gretal, Snow White and the Seven Dwarves, Cinderella and the Brave Little Tailor. The production began in September 2016 and consisted of Tuesday and Thursday Rehearsals each week spread over 5 months. The show sold out 3 of 5 performances and was performed to over 600 audience members. This was a brand new production which premiered and was a first for the Perryway Players. It was also the debut of our youthful production team and directors, Jessica Grace Weaver and Rhys Maule. This was an original pantomime based on the story of Little Red Riding Hood. It featured a very young cast, with the lead being only 12 years old. 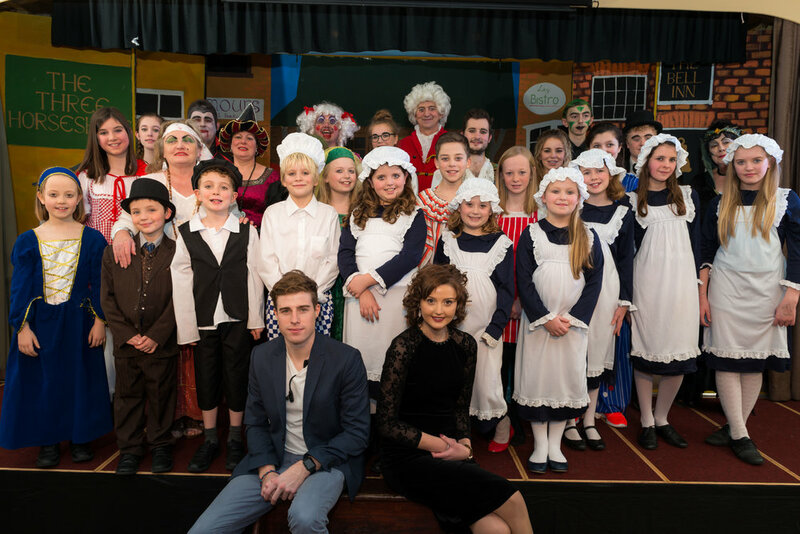 Molly Johnson was accompanied by a mixed cast of experienced members, Ben Deacon as Jack, Craig Hunt as Dame Granny Smith and large cast of Livewire. The production began in September 2015 and consisted of Tuesday and Thursday Rehearsals each week spread over 5 months. The show sold out 2 of 5 performances and was performed to over 600 audience members. This production was created by David Wheeler. It was performed in memory of the 70th Anniversary of VE Day. A mixture of live radio plays, flashbacks, small acts and songs re constructed for the modern day. This production was performed for just two dates and many have said it was the best revue production by the Perryway Players for many years. The auditorium was decorated with authentic memorabilia and was set in a cafe style environment. This play introduces the inept and bungling Inspector Pratt, who battles against the odds and his own incompetence to solve the murder of the house’s owner. It soon becomes clear that the murderer isn’t finished yet; will the miscreant be unmasked before everyone else has met their doom or will the audience die laughing first? It was performed from 14th - 15th May 2015 and was highly received from our local audiences. The story tells of how Mother Goose is about to be thrown off her land because she cannot pay the Squire and his Bailiffs the rent. Along comes Priscilla the goose. Mother Goose loves her as a friend and doesn’t know the good fairy has sent her to help Mother Goose. Priscilla lays golden eggs, and Mother Goose is rich. Along comes the Demon King (sometimes called “Demon Discord”). He has a bet with the fairy. He claims there is no-one on earth who is happy with what they have got- no one is content. They want more. The fairy Disagrees, and uses Mother Goose as an example of goodness. Just a decade ago, if people wanted to watch a show on television they had to figure out when it would air and then tune in to the correct channel at the correct time. Fifty years before that, even though black and white television was relatively common, the big entertainment came from radio. Radio dramas, plays that were heard on the radio rather than seen, were the 1940s version of the modern TV show - a story that is either told in a half an hour or that continues with a new installment each week. One popular radio show, Suspense, regularly aired short, suspenseful radio plays. In 1943 Sorry, Wrong Number first aired on the Suspense radio program. This story by Lucille Fletcher went on to be considered one of the greatest radio drama episodes. It was adapted to become a movie, and a later production of the radio drama won The Edgar Award for Best Radio Drama. The Hitch-Hiker is a radio play written by Lucille Fletcher. It was first presented on the November 17, 1941, broadcast of the Orson Welles Show on CBS Radio, featuring a score written and conducted by Bernard Herrmann, Fletcher's first husband. Welles performed The Hitch-Hiker four times on radio, and the play was adapted for a notable 1960 episode of the television series The Twilight Zone. The Canterville Ghost is a novella by Oscar Wilde. It was the first of Wilde's stories to be published, appearing in two parts in The Court and Society Review, 23 February and 2 March 1887. The story is about a family who moves to a castle haunted by the ghost of a dead nobleman, who killed his wife and was starved to death by his wife's brothers. It has been adapted for the stage and screen several times. The Pantomime version of “The Sleeping Beauty” tells the story as outlined by Perrault, and often follows this plot: The Panto often opens with the Christening Scene. The Bad fairy gives her curse, and vanishes. The Good Fairy casts her spell- that the Princess will not die, but sleep for one hundred years.